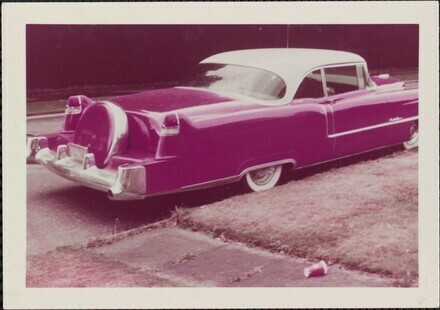 Home » Collection » "Mary Girow's Cadillac"
On verso, center right, stamped in black ink: Photographer Mary K. Nickerson / Subject / Type of film / Shutter / a.m. / Aperture / p.m. / Focus / Filter / Date; by unknown hand, in blue ink: Mary Girow's Cadillac / Ektachrome / 1/25 / F 8 / 2:45 / 14 ft. / Skylight / 9-9-56; upper center, by Robert Jackson, in graphite: 18. The Art of the American Snapshot, 1888-1978: From the Collection of Robert E. Jackson, National Gallery of Art, Washington; Amon Carter Museum, Fort Worth, 2007 - 2008, no. 117.